Since we’re travelling as a couple, the averages described below are for two people per day and they’re actually all rounded up. Hotels in Hawaii are pretty much out of the question when you’re travelling on a budget. You don’t want to get too low either and give up on quality sleep. When travelling long-term, the places you’re staying at can have a huge impact on the way you feel overall and on how you’re going to experience your trip more than just on your sleep. We couldn’t find a room for a decent price in Kauai (we started looking for a room a bit too late, I learned my lesson!) and decided to stay in a hostel for 5 nights. I used to like staying at hostels but it was different this time. Having to tell ten different people about our day and our plans every morning before leaving and every night when coming back would get on our nerves. We also didn’t enjoy sharing a room with snorers and people we didn’t know and thus didn’t necessarily trust. This experience tainted our first week on the island because we were constantly tired and just needed some quiet time. 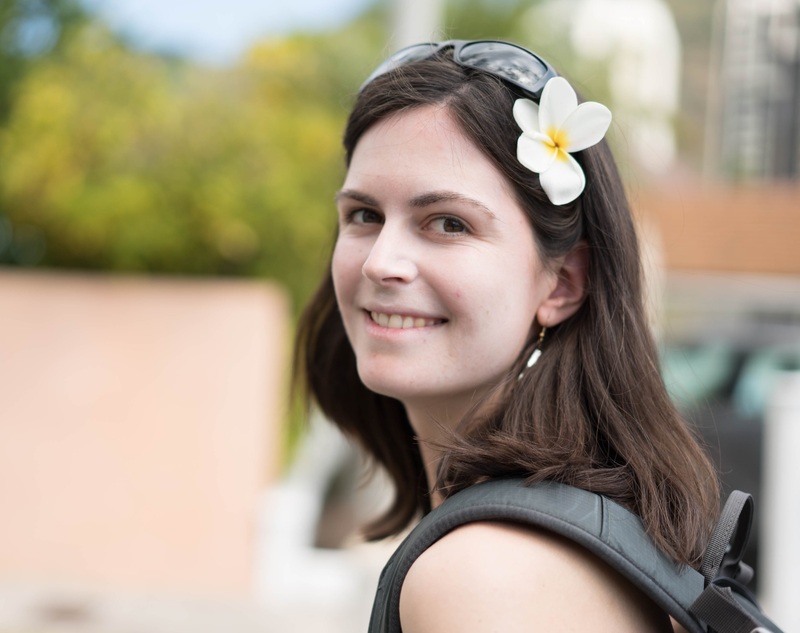 I also have to say hostels are actually not that cheap in Hawaii, especially when traveling with someone else and we eventually paid barely higher prices for private Airbnb rooms. Airbnb was our go to almost the entire time. We would usually get a private room or a tent in a nice yard giving us total independence and access to a kitchen. Whether it’s at the restaurant or in supermarkets, food is expensive in Hawaii. Even after six weeks there, I would still get surprised at prices in supermarkets and I still wonder how people can actually live there and eat properly every day! We ate out a few times but nothing extravagant (between $5 and $10 per person) and we did treat ourselves with shaved ice a few times. Most of our lunches were some nuts and dried fruits mix, cheese and fruits that we would pack before leaving for the day. At night, we mostly cooked at home what I like to call our “power meal” composed of rice, lentils, roasted bell peppers (we were lucky to have access to a barbecue for a week on Oahu) and meat for Simon. We would also take advantage of discounts at the fresh food section of supermarkets at the end of the day. On Oahu, the bus system is pretty good and it was our main means of transportation. The very first night though, we arrived late at night, we were tired and had no idea where to look for the bus so we quickly decided to take a taxi to get to our room, downtown Honolulu, which cost us $30. The rest of the time, we used the bus. It’s usually not on time and you have to be ready to take a two-hour ride one way to go to certain places depending on where you are staying but it goes pretty much everywhere. A one way ride is $2.50 and includes transfers but we actually got month passes which still made sense for us even if we had just over two weeks left on the island when we got them. 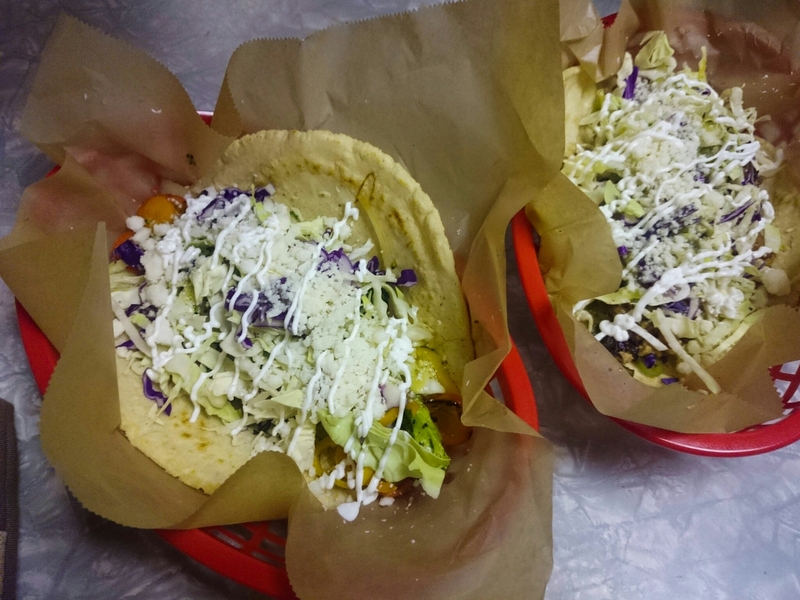 A month pass is $60 per person and is valid from the first day of the next month. We bought our passes for March on February 26th. Technically we should have got a four-day pass but we took the chance and on four days, taking the bus at least twice a day, only one bus driver didn’t accept our passes and had us pay. On Kauai though, it was different. We got quickly confused with the bus system there which is not as developed as on Oahu. First, it doesn’t go everywhere on the island. And we couldn’t figure out the routes, the schedules and where to transfer when we needed to. We decided to work on our budget again and hire a car for the entire stay (three weeks). I have to say it was a great decision. We didn’t miss out on anything we wanted to see, we loved feeling completely independent and it was so relaxing compared to depending on the bus all the time. Of course, it makes the daily average for transportation go up but it’s all included (car, petrol and bus) on our $60 per day and per person. 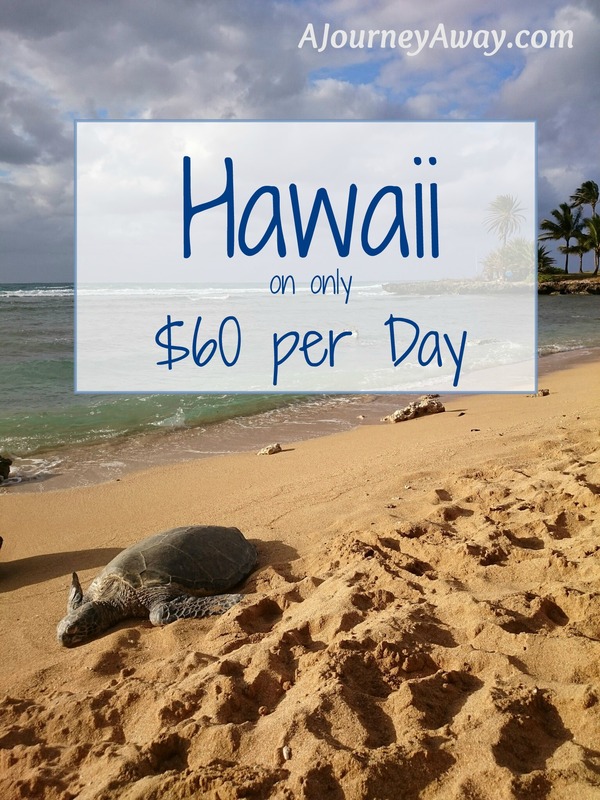 This average also includes the flights from Honolulu to Lihue, Kauai and back which were about $140 per person. 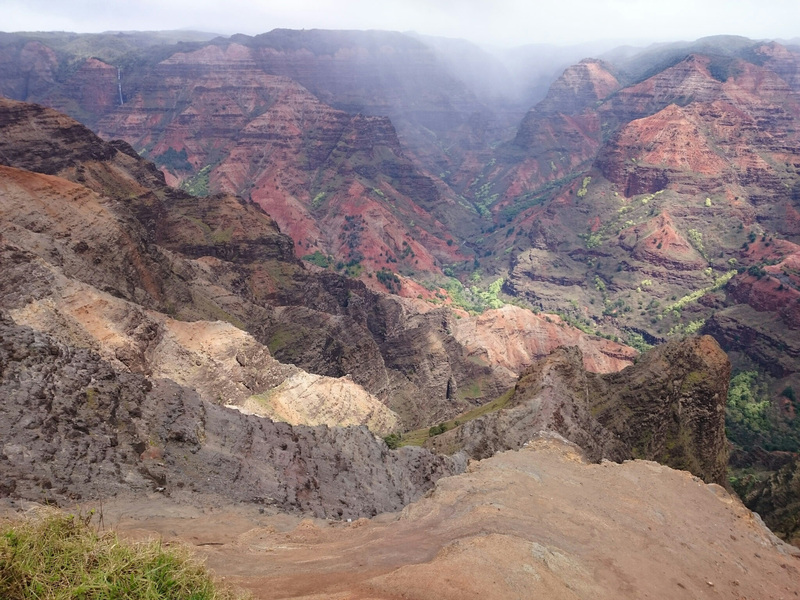 We would never have seen Waimea Canyon, Kauai without a car! In Hawaii, it’s easy not to spend any money on activities. There are so many wonderful beaches and hikes that it’s not difficult to keep that part of the budget low. 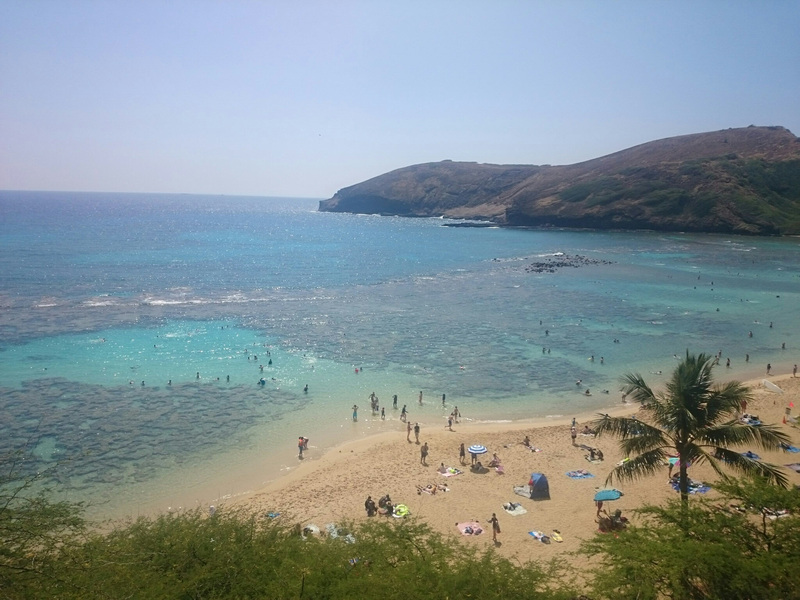 Some places are still worth paying for like Hanauma bay which offers the best snorkelling experience or Waimea valley where you could literally spend the whole day. This category also includes things like doing the laundry (most of the time we were able to do it for free at our Airbnb place though), cleaning the car and other small things. 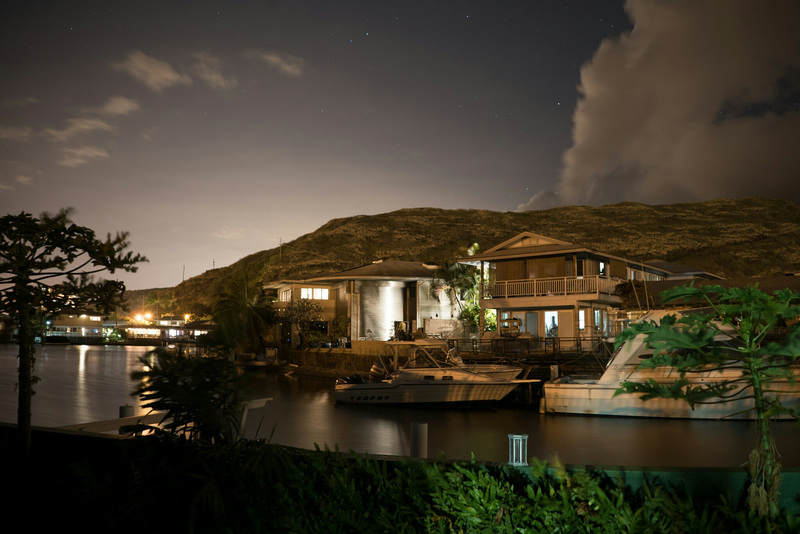 So yes, Hawaii is expensive but you shouldn’t cross it off your list even if you’re on a tight budget. It’s definitely possible to travel through the Aloha State on a budget and still get some luxury like a rental car. This budget can even be reduced further if you choose to visit only one island or skip the car.